I get pretty ecstatic when I come across a good science program that serves to educate the general public in one of my favorite academic areas - astronomy. I recently reviewed an upcoming Nova documentary that is absolutely excellent. The program called “The Pluto Files” airs for the first time on Tuesday, March 2, 2010 at 8pm ET/PT on PBS. The show is wonderfully moderated by Dr. Neil deGrasse Tyson, director of the American Museum of Natural History’s Hayden Planetarium in New York City. In line with Tyson’s charismatic style, the show is an excellent choice for all ages especially children. I can see this program as an excellent way for the entire family to spend a nice educational evening at home. The show had special significance to me because as a young boy, I fell in love with a children’s astronomy book called “The Search for Planet X” by Tony Simon (1962, Scholastic Book Services). I must have read that book at least 100 times because I was fascinated with the hunt for an unknown planet. To me, the search for Pluto presented the best in scientific discovery. I was hooked on science at age 8! The program then turns to the story behind the demotion of Pluto as a planet with the 2003 discovery by Michael Brown of Caltech of a Kuiper Belt object called Eris (originally named “2003 UB313”), that is actually larger than Pluto (27% more massive than Pluto). The discovery turned the field of planetary science on its head because if the new Eris was to be classified as the 10th planet, then a number of other objects should be as well. 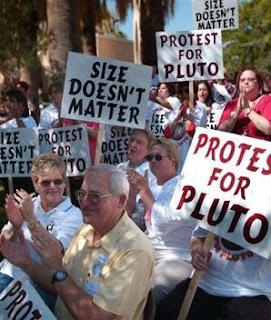 It was then that the International Astronomical Union (IAU) held a vote to demote Pluto to a dwarf planet (or Plutoid). The only problem I have with Tyson is that he likes to fashion himself as the “Pluto killer” because he started to challenge Pluto’s status as early as 1999, but it was really Caltech’s Brown who is credited with the science behind Pluto’s demotion. In a very poignant part of the film, we learned that Tombaugh’s ashes are aboard the New Horizons spacecraft headed to Pluto with an arrival date in 2015. I highly recommend this documentary! Tyson seems to have moved away from portraying himself as the "Plutokiller" to a more intermediate view of a moderator who presents both sides of an ongoing debate. From the beginning, he criticized the IAU decision as "flawed," and he now states that he never publicly said our solar system has only eight planets. He accurately noted there is no consensus among astronomers on this issue. Mike Brown loves to say he "killed Pluto," but this is unprofessional and simply not true. Only four percent of the IAU voted on the controversial demotion, and most are not planetary scientists. Their decision was opposed by hundreds of professional astronomers in a formal petition led by New Horizons Principal Investigator Dr. Alan Stern. There is a legitimate case for classifying dwarf planets as a subclass of planets large enough to be rounded by their own gravity but not large enough to gravitationally dominate their orbits. That makes both Pluto and Eris planets, as well as Ceres, Haumea, and Makemake. Good food for debate! My point about Tyson was that he's gone on late night TV and spouted off about being the Pluto-killer when all he did was use his position to deliver his opinion that Pluto was not a planet. He is not a planetary scientist nor did he provide any new research that supported his view. Brown, on the other hand, is a well-known planetary scientist and with his discovery of Eris did provide a rational basis for the re-classification of Pluto. To be sure, the Pluto controversy is the result of the work of many people, but if you had to single out one person who had the most influence it would have to be Brown, certainly not Tyson.